Don’t delay this gratification. Do it now. I hope that the envelope containing my ballot, along with the envelopes carrying yours and those of your extended family and your alumni associates and your American colleagues will deliver a mandate for change. Polls in your State may show a commanding lead for Barack Obama. Yet your vote is crucial as proof that We the People want his administration to be able to govern unobstructed by the kind of politics plaguing this campaign.Vote. Now. You will never have known how good you can feel. Have you voted your ballot? 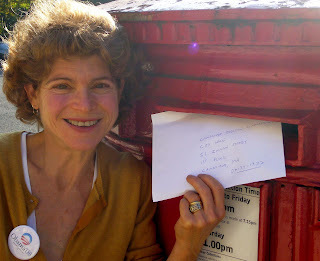 Send me a photo of yourself putting that ballot in the postbox (AKA - the voting booth for Americans Abroad). Got friends who haven't voted? Send them the link to this page and get them moving!